Around a dozen species from this genus, both amphibian and totally aquatic, constitute some of the most popular aquarium plants. 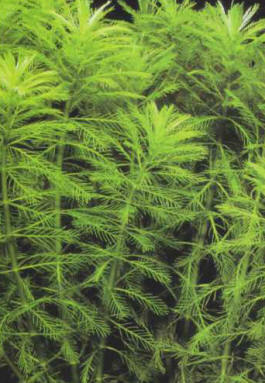 Their soft foliage is appreciated by fish with herbivorous tastes, while others use it to lay their eggs. The aquatic milfoils thrive on light and relatively hard water, although this must be clear, as small suspended particles get trapped in the foliage. The main method used for reproduction is that of taking cuttings. In contrast with the other species, the water milfoil prefers soft, acid water. Cuttings are taken by removing the top or the tiny branches. You can achieve a stunning decorative effect by planting a copse of these plants. Size: 40 cm. The spiked milfoil is a hardy, fast-growing plant that needs fairly hard alkaline water. It must be pruned regularly to ensure that it remains sturdy. Several other species of milfoils are available on the market, some with reddish hues; they all require good lighting. Size: 40 cm. ЦЕПКОХВОСТЫЕ ОБЕЗЬЯНЫ (цебидовые) , семейство широконосых обезьян. Длина тела 22-72 см, хвост у большинства длинный, хватательный. 31 вид (ревуны, капуцины, саймири и др. ), в лесах Юж. и Центр. Америки. Образ жизни дневной (кроме мирикини), древесный. 10 видов в Красной книге Международного союза охраны природы и природных ресурсов.